Do you guys think there would be a market for an iron sighted detachable magazine 557 Carbine or Sporter in the US chambered in .308, 7mm-08, and .243? I know CZ released the iron sighted Carbine in .30-06, .270, and 6.5x55 a few years ago and then dropped it. Granted that was a long action with a hinged floor plate. I wanted one BADLY...didn't have the finances available to get the 557 iron sighted carbine when it was available, and I did contact CZ-USA directly. The answer was the iron sight version did not sell as well as they had hoped. Personally, I thought is was great - I love iron sights, and 308 would stretch my range out far past my CZ 527M/CSR in 7.62x39mm. 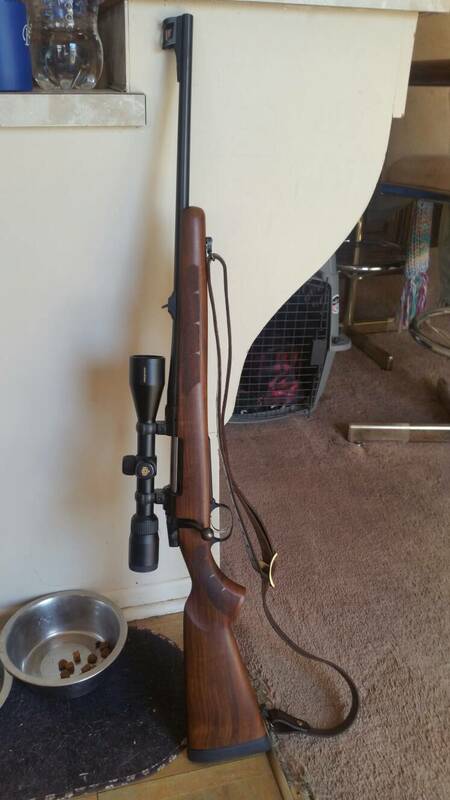 I have always thought the worlds best back up sights are irons, so if the scope becomes damaged during a hunt, I can keep going with irons. That is popular in Europe, but not here in the US, where glass reigns supreme. Picked up my 557 carbine chambered in 30-06 at a pawn shop.The guy said he hade it a year cause no one trust the push feed. Have had not 1 problem with it. Wayne, what sling is that? I looks perfect. Dog food is empty. Just sayin'. That was the .308 I wanted, with the iron sights, never managed to snag it. How do you like it? I got excited when I saw the 557 Range Rifle in the CZ catalog and then disappointed when I realized it wasn't the CZ-USA catalog for 2018. That's a shame we can't get them in the US because I love the idea of a bolt action with iron sights in .308 or .223. I saw a pretty positive review of the rifle on youtube in which the reviewer had removed the rear sight and replaced it with a NECG peep sight that attached further back on the reciever. I definitely think there is a market for these type of rifles. I asked why the Carbine iron sighted version was dropped, and it was due to slow sales. Most hunting rifles out here go right to glass, very, very few people hunt with irons. I'm just a cave dwelling throwback, I guess. I'm just a cave dwelling throwback, I guess. Hardly - you can watch some of my videos to see that isn't true. Hey guys, is the 557 chomed lined?